In chapter 2, a systemic review of investigated factors that potentially may influence fentanyl pharmacokinetics is reported. Factors were split in in four groups: pharmacokinetic drug-drug interactions, environmental factors, patient related factors and pharmacogenetics. In chapter 3, we describe methods for bioanalysis of opioid concentrations in plasma of patients with cancer. The used methods are validated for analysis of fentanyl, norfentanyl, morphine, hydromorphone and the metabolites morphine-3ß-glucuronide and morphine-6ß-glucuronide. In chapter 4, we present a study on the influence of the common patient characteristics, variation in BMI and smoking yes or no, on the exposure of transdermal fentanyl in patients treated for cancer related pain. We aimed to partly explain the wide differences in fentanyl pharmacokinetics between individual patients. In chapter 5, we present results of two separate studies investigating the effect of the localization of the fentanyl patch, upper arm versus thorax, and the use of the moderate CYP3A4 inhibitor aprepitant, on the exposure of transdermal fentanyl. These factors were not earlier studied in patients with cancer and might explain (a part of) the variety in fentanyl pharmacokinetics. In chapter 6, the results of a prospective study in patients with head and neck cancer treated with chemo- or bioradiotherapy is reported. We studied the influence of mucositis on the exposure to sublingually delivered fentanyl using an intra-patient comparison. Besides we describe the effect of xerostomia on the exposure to sublingually delivered fentanyl in these patients six weeks after the end of chemo- or bioradiotherapy. 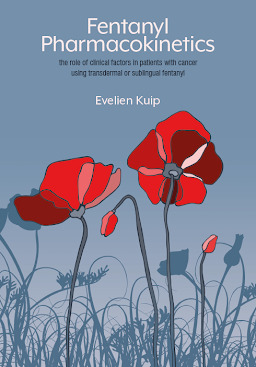 In chapter 7, a summary of the studies described in this thesis, a discussion on the methods and findings and recommendations for further research are given.